It feels like that trade happened so long ago, but it’s really only been about 2 years. Since then, the early returns have been a mixed bag for both teams. For the Nationals, Adam Eaton has been mired by injuries, limiting him to just 118 games over the past two seasons. On the White Sox side, Lucas Giolito hasn’t seen much success in the majors yet, but still has an incredibly high ceiling, while Dane Dunning is quietly climbing up the league’s prospect ranks. And then there’s Reynaldo Lopez, the reason you all clicked on this article. Lopez has struggled so far during his time in the Major Leagues, posting ERA/FIP’s of 4.72/4.75 and 3.91/4.63 in 2017 and 2018, respectively. During that time, we’ve seen extremely volatile strikeout and walk rates, along with a myriad of inconsistent pitching performances. Many fans and writers began to write Reynaldo off. They’d cite these struggles, among others, and seemingly forget that he’s only 25 years old and boasts limitless potential. Well, I’m here to tell you that Reynaldo Lopez is much closer to realizing that potential than you may think. To understand why, all you have to do is remember one word: September. Let me start by showing you some graphics from Baseball Savant and Fangraphs to set the stage. First up, let’s examine the chart below to see Reynaldo Lopez’s 2018 monthly breakdown of xwOBA allowed by pitch type. Check out that huge xwOBA drop off from August to September (on ALL of his pitches, mind you)– that’s a combined 86 point dip in xwOBA allowed! This instantly caught my attention and piqued my interest. While pitchers randomly have good months all the time, not many exhibit across the board improvements like this. Small sample size be damned, I had to look deeper into September, which brings us to our next graphic (below). Why did this happen? What’s so significant about September that suddenly made Reynaldo Lopez pitch like he’s never pitched before? Is he just another case of small sample size, or is there something more here? I had my hunches that such a drastic, across the board improvement could not simply be cast into the “small sample size” conclusion bucket, so I dug a little deeper. The above release point charts represent a clear change in Reynaldo Lopez’s pitching mechanics. On the left, you can see his release points during the April – August timeframe. This represents a dispersed and sporadic release point, which gives the hitter an advantage when trying to identify pitches off the hand. On the right, however, you can instantly notice a clear difference. His release point is tighter and much less dispersed. This takes away a great deal of information from the hitter, as it’s harder to identify pitches when the pitcher’s release point is tighter. 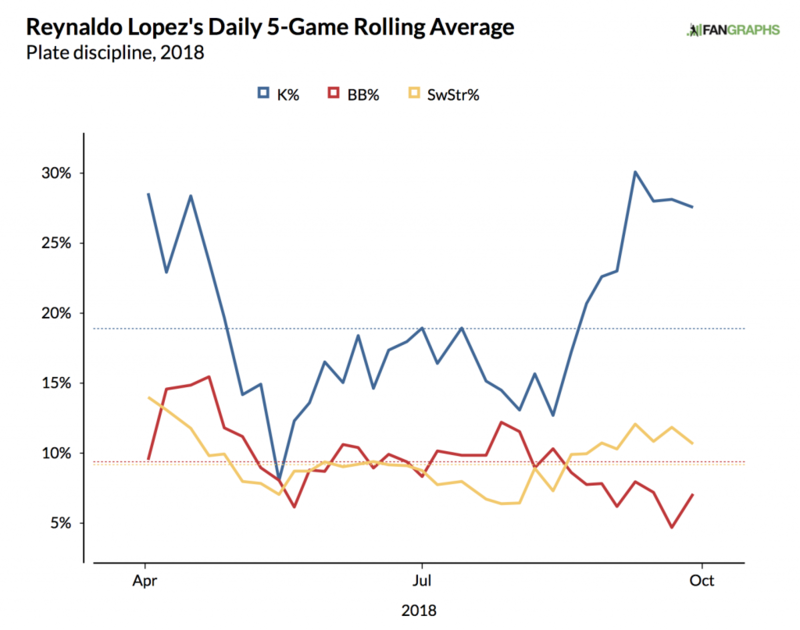 Confusing hitters and generating uncertainty is the goal for nearly every pitcher, and Reynaldo Lopez accomplishes this goal much better with his revamped release point. So, what actually happened to get his release point so consistent? Are there noticeable changes in his delivery? It turns out there are, and they’re pretty drastic as well. Before we dive into the specifics though, let’s identify what we’re actually looking for when measuring quality pitching mechanics. Fortunately, Hall of Famer Pedro Martinez does a great job detailing his “Keys to an Effective Pitching Delivery” in this 3 minute video clip below. Check it out, and then we’ll apply his principles to Reynaldo Lopez’s revamped mechanics with the help of some GIFs and side-by-side pictures. Great, now that we’ve heard how Pedro Martinez evaluates pitchers and deliveries, let’s examine the changes Reynaldo Lopez made to his own revamped pitching mechanics. I’ll start with his windup first, then move into his stretch. To start off, take a look at these two GIFs below showing Reynaldo’s windup. The first GIF (vs. MIN) represents his Pre-September mechanics, while the second GIF (vs. BAL) represents his September mechanics. See if you can notice any differences between the two GIFs, and then we’ll break them both down after with a few side-by-side pictures. Did you notice any differences between the two GIFs? They’re subtle, but very significant. Let’s break down the differences below. The first side-by-side picture is from the GIFs you just saw, while the second side-by-side is from two different outings. For both side-by-sides, the left picture shows his Pre-September mechanics, while the right picture shows his September mechanics. If you notice the (horribly drawn) lines I put on the side-by-side pictures, you can see that there are two aspects I want to point out here. First, take note of Lopez’s posture for all four pictures. On the right, you can see how Lopez’s posture is much more straight than his posture on the left. This allows Reynaldo to be taller on the mound, while also helping him stay consistently balanced pitch after pitch. Before his mechanics change (left), you can see that he has a slight crouch in his delivery, a more pronounced bend in his right knee, and also leans his body a bit towards the first base side. These sub-par mechanics left him more off-balance throughout his delivery, and also seemed to impact my second observation- his leg kick. Reynaldo Lopez’s leg kick is a huge part of how he (and most pitchers) generates momentum, velocity, and consistency. Given the importance of this area of pitching mechanics, you can see how Reynaldo struggled pre-September– his leg kick was all over the place! For reference, let’s go back to 8th grade geometry and try to identify the angles that his leg kick makes in the pictures above. On the left, his leg kick angle is maybe around 120 degrees? 130? It varies quite a bit. On the right, however, his leg kick is much more compact and consistently the same angle, maybe around 60-70 degrees. This leg kick change is a complement of the change he made in posture, as both greatly contribute to overall balance and consistency. To put a bow on all of this, Reynaldo Lopez’s increased balance and overall simpler delivery in his windup allows him to have better body control and feel for pitches, since he’s simply not as wild in his movements as before. All of this then directly points to the release point charts we saw above, since it’s easier to reach the same release spot consistently if your mechanics are easily repeatable. This is devastating for hitters, and greatly improves Reynaldo’s overall deception and potential for success. However, success is hard to reach if you can’t pitch in both the windup and the stretch, so what happened with his stretch mechanics? We’ll follow the same format here as we did with Reynaldo’s windup mechanics. Check out these two GIFs below and try to identify any differences in his mechanics, then we’ll break them down after with a side-by-side picture. The first GIF (vs. TOR) represents his Pre-September mechanics, while the second GIF (vs. BAL) represents his September mechanics. Reynaldo Lopez’s mechanics change for his stretch is very significant. Look at the picture on the left. You’ll notice that he’s standing straight up with his hands sitting at his waist. Then, upon starting his pitching motion, he synchronously moves his hands and legs upwards before delivering his pitch, likely to help generate momentum. However, this specific motion is very difficult to do on a consistent basis. The relationship that’s formed here between Reynaldo’s arms and legs needs to be perfect, or else he risks throwing a sub-optimal pitch. This happened quite a bit pre-September, as he was often off-balance and could never seem get his arms and legs in sync. Finding a solution to this problem became a focal point of his revamped mechanics in September, and fortunately seems to be remedied. To illustrate this solution, look at the picture on the right. You’ll see that Reynaldo begins his stretch with his arms near his head. This all but eliminates that extra movement of synchronously moving his arms and legs upwards, and allows Lopez to just focus on bringing up his leg. Taking away that unnecessary upwards arm movement (and adding in a slight bend in his right knee) gives him additional balance, a more compact leg kick, and an increased emphasis on keeping his elbows in (which would often flare out when moving his arms upwards). These are incredibly significant changes which, like his windup, help him to keep things simple, reach his optimal release point more consistently, and increase his overall deception and control. All in all, I fully realize that only using September to predict a Reynaldo Lopez breakout could seem foolish, given every small sample size principle ever. However, I’m a firm believer that significant mechanical changes like these should not be overlooked. They’re subtle, but accomplish all three goals Pedro Martinez laid out for us in the video above: Reynaldo now has much better balance, a significantly more controlled (and less wild) delivery (resulting in Pedro’s “quiet landing” point), and the ability to now reach his optimal release point on a more consistent basis. These mechanics changes certainly won’t result in Reynaldo Lopez putting up a 1.09 ERA in 2019 like he did in the last month of 2018, but he will definitely see drastic improvements across the board. I’m looking forward to watching the young hurler’s progress, as I firmly believe he’s poised to break out in a big way. If and when he does, your job is simple. All you have to do is Remember, Remember, Lopez in September.